You Start The Game By Digging Potatoes. After Digging, You Unlock Farmers. Farmer Produce Potatoes, The More You Have Potatoes The More Farmers You Can Buy. The Cost Of Recruiting 1 Farmer Is 100 Potatoes. After Recruiting 10 Farmers, You Unlock Communes. Communes Produce Farmers And Farmer Produce Potatoes. This Is The Production Cycle. 1 Commune Cost Is 10 Farmers, 1,100 Potatoes, And 5 Comrades. You Have To Dig Potatoes – Then Buy Farmers, Communes, Workers And So On. After Commune, You Unlock Collective Which Costs You 100 Lands, 50,000 Potatoes, 5 Comrades, 10 Commune. Watch Ad To Receive A 2* Boost For 4 Hours[Optional]. You Can Watch 6 Ads In A Day. 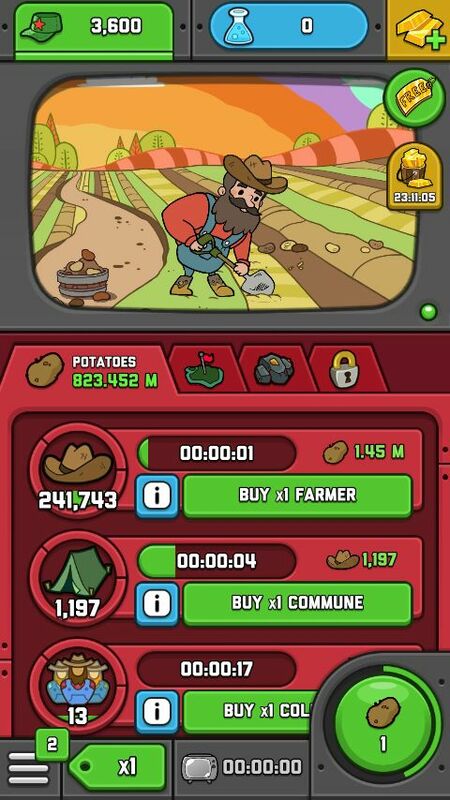 As Adventure Communist Is An Idle Clicker Game, You Have To Click Rapidly To Dig Potatoes, To Buy Lands. Farmers Dig Potatoes Automatically. Similarly, Commune, Collectives, Workers Do Their Work Automatically. Buy 10 Workers And You Unlock Blastic Site. Blasting Site Cost Is 1.304 M Potatoes, 25 Workers, 200 ORE. 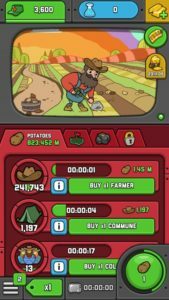 Gather Resources, Dig Potatoes, Upgrade With Experiments, And Make All The Means Of Production Efficient. Overall, Adventure Communist Is A Nice Idle Clicker Game. But To Progress Fast, To Buy Science You Have To Watch Ads, Spend Real Money. Price – Free(Contains Ads, In-App Purchase), Size – 56 MB. Download – Here(Google Play Store). Working UFO Is A New Android Game Released By Creators Of Super Smash Bros.